We all have them, those little hole-in-the-wall places that we’ve driven or walked by a million times thinking, “I should go in there,” but for some reason we never get around to it? I’ve discovered several great places that way (and a few marginal ones as well, to be honest), but one of our more frequent day trip destinations in Northampton, MA. It’s a nice little college town, with a yarn shop that Carol likes (Webs), a great tea shop, and a lot of little restaurants. 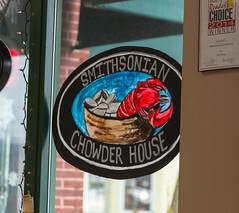 Almost every time we go there, we end up parking in the municipal lot next to the bus station, and every time that means we walk by the small and simply decorated Smithsonian Chowder House. There’s also a location in Hatfield that we’ve driven by a few times, but we’re never seeming to do it at lunch time. But a recent trip down to Chicopee (to the most unusual Hu Ke Lau that’s still doing Polynesian dinner shows, and worthy of it’s own review at some point) ended up with us being in Northampton right around lunch, and we finally go to duck in. The interior of the Smithsonian Chowder house is what I call “basic deli decor”, it’s basically a relatively sparsely decorated space with a serving counter, industrial polished-concrete floors, and a bunch of four-topper tables. But there’s also a rather large menu board with an almost implausibly large number of soups, a large oven for baking and reheating popovers, and a good selection of make-your-own-sandwich fixings. Indeed, I’ve pretty much just given you the menu: it’s a basic soup and sandwich shop that also offers popovers. So that’s what we ordered, soup, sandwiches, and popovers (with a drink, that made a lunch deal). First of all, let’s talk about the soup menu. Walking in the door, you immediately get the list of soups, and it’s an impressive list; on our visit, it included three different chowders (seafood, clam and corn), three different chilis (vegetarian, turkey, and normal), turkey noodle, Navy bean soup, lazy golumpki (cabbage roll) soup, and a vegetable bisque. Quite the selection indeed. Often, this is a warning flag to me, indicating that the place is just reheating big vats of pre-packaged soup, but the pleasant aromas indicated that these were quality soups, myself settling on the lazy golumpki soup, and Carol going for the classic clam chowder. The lazy golumpki soup (I think the “lazy” means that instead of doing the traditional making of it from leftovers, you’re just adding the ingredients for a golumpki to the soup) wasn’t shabby at all, despite the name. It was a rich, flavorful blend of meat, cabbage, tomato, and spices, reminding me well of the many pleasant cabbage rolls I’ve had in my life (seeing that Carol and I are both of Polish and Lithuanian heritage). 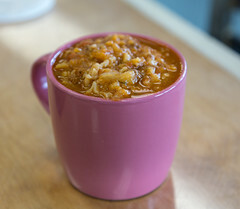 I’d definitely enjoy another cup of this, especially since unlike most restaurant soups it wasn’t over-salted. 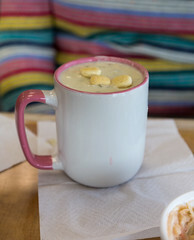 Carol’s Clam Chowder was good, too. All too often New England clam chowder ends up being a creamy, glue-ish mess (one reason I prefer Rhode Island chowder, since sins can’t be hidden under a cream sauce), but that wasn’t the case here, with a smooth, creamy, and very flavorful and clam-rich chowder, one of the better ones we’ve had recently. Next up was the popover, and here the results were a little mixed. 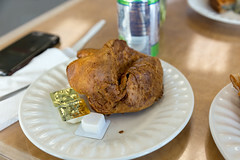 I really like the concept of the popover (indeed, one of the real attractions of going to my local diner is that they have awesome popovers), and the popover here had most of the qualities I look for: it was nice and crispy, very pillowy, still a bit moist on the interior, and nice and steamy. It was, however, also rather salty, in fact distractingly so. If this was buried under some soup or chowder (one of the items at Smithsonian is the “stuffed popover” I may not have even noticed it, but on it’s own, I found the salt unpleasant. Either too much salt, or a leavening agent leaving some leftover taste here. A shame, since otherwise this was a good concept. But Smithsonian redeemed itself with the sandwiches. Conceptually, my sandwich was pretty simple: the daily special of a turkey BLT. 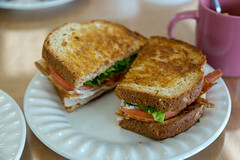 And indeed, that’s what I got: turkey, bacon, lettuce, tomato, and a shmear of mayo on grilled toast. But for such a simple sandwich, they did a good job executing it: a thick slab of turkey breast (not deli slices), some decent bacon, a nice thick, large tomato slice, and some nicely prepped lettuce on grilled wheat bread. This combined quite well with my golumpki soup, and made for a pleasant lunch. 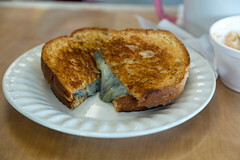 Carol opted instead for one of the grilled-cheese-sandwich options, with pepper jack and blue cheese on wheat bread. The result was a nicely executed, crispy, and thoroughly melted-cheese grilled cheese sandwich. Definitely a good sandwich. Overall, despite the popover (which I might get one more time in case my salty one was a one-off error), I rather enjoyed Smithsonian. 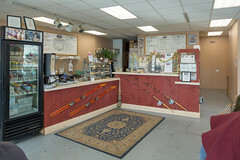 The sandwiches were well executed, the soups very enjoyable with an extremely good selection, and the staff pleasant. I’ll definitely drop in another time for lunch if in the area.